What do you get the person who has everything this Christmas? How about an app? 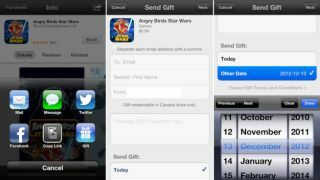 Well good news, as Apple has just brought back the ability to gives apps as gifts. Because if you are shopping for someone who has everything, surely there must be an app for that. The feature was present in iOS 5, but Apple dropped it for iOS 6. But now it's reinstated, you can get started on your Christmas shopping over at the iTunes Store. All you have to do is open the App Store on your iOS device and choose the paid app you'd like to give. Click the Share button in the top right, and a Gift icon will appear. Tap it, and enter your Apple ID password. You may also have to confirm your payment method. Enter your recipient's email address, and add a personal message, if you like. Select the date for them to receive the app, and a colour theme (like a digital version of wrapping paper), tap Buy Gift, and you're done. Of course, if you don't know much about your recipient's taste in apps, you can always give them an iTunes voucher through Facebook Gifts.